We offer cost-effective web design that works hand in hand with your social media plan! We can make your website pinnable! Because our web design works hand in hand with your social media plan, we work with Pinterest to verify your website. 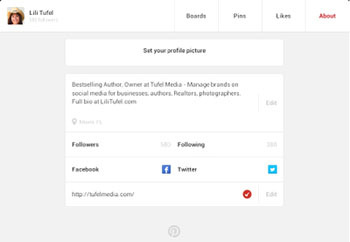 Once your website is verified on Pinterest, your URL will be prominently displayed at the top of your Pinterest page with a check mark next to it. Having a check mark creates a dramatic effect and tells other users that your website has been verified by Pinterest and that you are the owner of the site. People are more likely to click on a verified site they know is safe as opposed to an unverified site they’ve never heard of. Rich pins show more detailed information than regular pins. This information includes automatically updated detailed information such as pricing, availability, ingredients and description. There are four types of rich pins: movie, recipe, product and article. Rich pins are available to companies who add special coding to their websites. 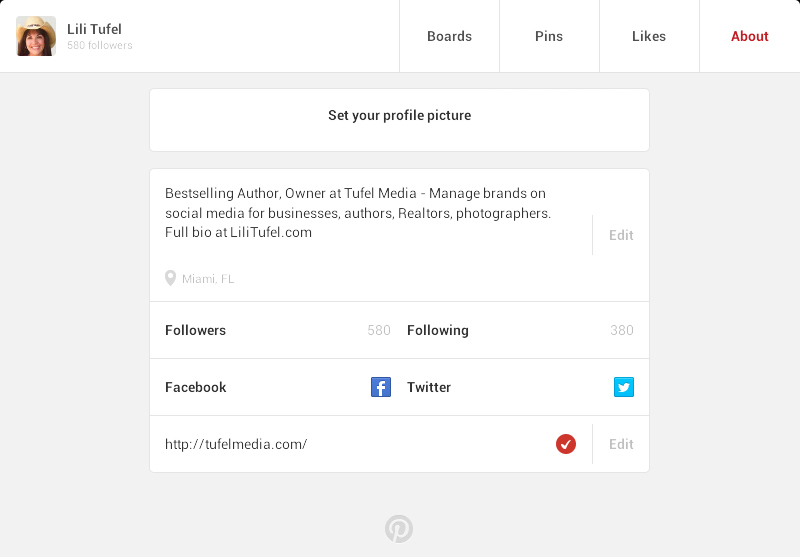 Adding this code to your site can help increase traffic and sales directly from Pinterest. Our web development team at Tufel Media can include these special meta tags in your web design! Your pins should all have captions. The captions should include keywords and hashtags in order to make sure that your pins show up in people’s searches. When you pin an image from your website, the pin automatically has your website URL as the source. When you upload a pin directly from your computer, phone or tablet, you should go back and edit the pin and add your website to the source. We make sure that your pins lead back to your website to help you increase traffic and sales. Many people who are on Pinterest are looking for things to buy. It is important that your pins include a call to action and lead people to your website, or the landing page with the call to action, where they can make a purchase. If you're looking to optimize your business through digital marketing with a brand-specific logo, images and key words. We'll build a responsive website and establish your online branding by creating social media accounts that engage your customers using the top social media sites. Developed by WebPowerSites All Content © Copyright 2013-2018. All Rights Reserved.